So the last remaining untouched LV painted locomotive and they want to ruin that by restoring it to a paint job it wore for like 5, 6, 10 years at most? Nice. I wouldn't say "untouched". It's wearing the third paint job she received, back in September, 1970. ( delivered in April, 1939, she was first repainted in May of 1950. 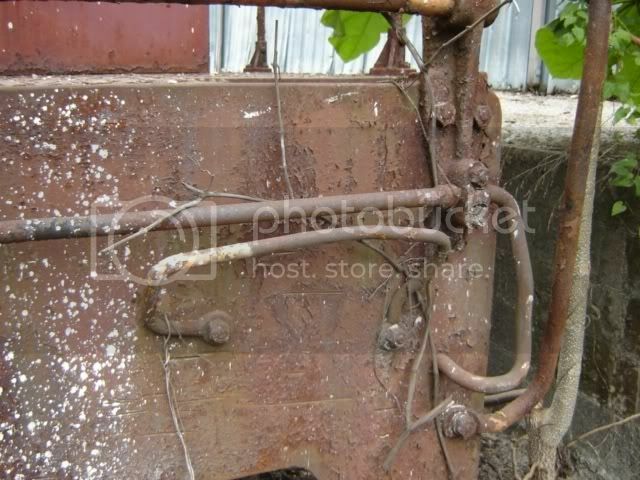 This means 11 years, upon closer examination) 37 years of being outside, unwashed, unwaxed and "unloved", has left that paint job faded, peeling, and being undermined, by rust. There's not enough to save. The mechanical damage done to the pilots, railings, stepwells, etc, and the fact it's been sitting in that siding, for years means there's lots to be done, just to save her mechanically. Once it's all finished, the sorry state of the 37 year old paint job would be rather pathetic. The fact she's been purchased by a group that intends to save, and restore her, should be the only thing that matters. I'd like to be there, with a camera, and a few rolls of UC, to document the sandblasting, and seeing what is uncovered, as she's blasted back to bare metal. Needless to say, now's the time to get those photos, and document what's left of the current paint scheme. Location: " SunRail CFRC 100, North at Church Street Station"
Is there another LV SW1 sitting around derelict somewhere, or was I thinking of this one? There was talk quite a while back about one but I thought that one had been repainted with only bits of the LV paint showing. Or maybe I'm thinking of something else, LOL! Thanks GA - that's the one I was thinking of. Hmmmmm....how about twins? Hi GA, not to get too specific, but do you know what state is she headed to? This thread reminds me of the cover article from the January 2008 Hemmings Motor News entitled "Restore it or leave it original?" 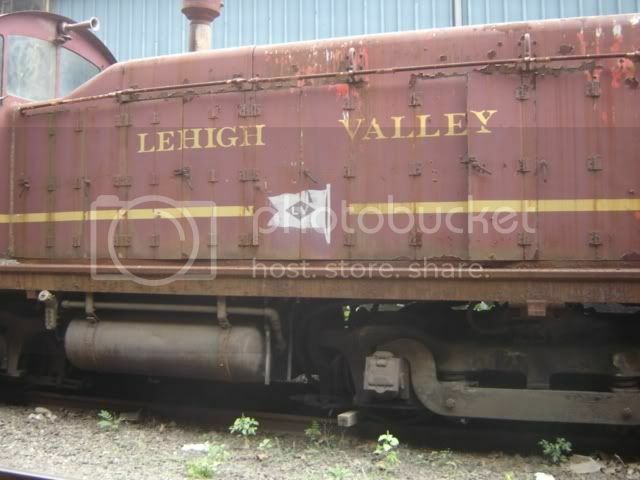 I think the locomotive and or museum will receive more publicity if it is a genuine Lehigh Valley painted unit. Think about it, "Museum X has the only unit in original LV paint anywhere" I would like to see this unit in original paint than restored. 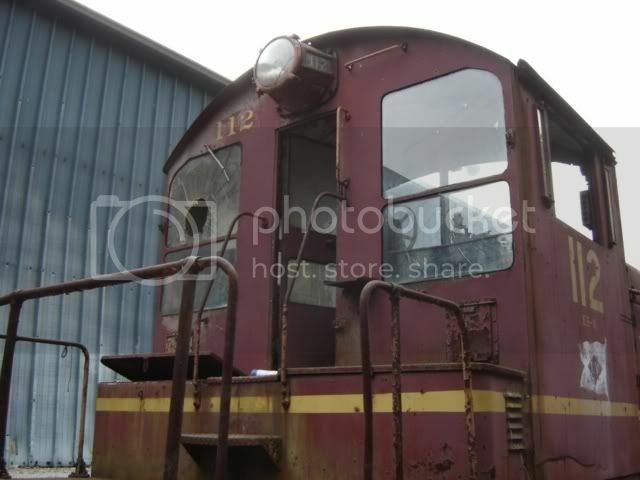 For the rest of you, here's a sample of pix, showing the state of the 112, as of a few months ago. Perhaps Scot, or someone else, might have a few more, to add. When looked at closely, only a fool would buy this, make the mechanical repairs, then leave this "original" paint on it. 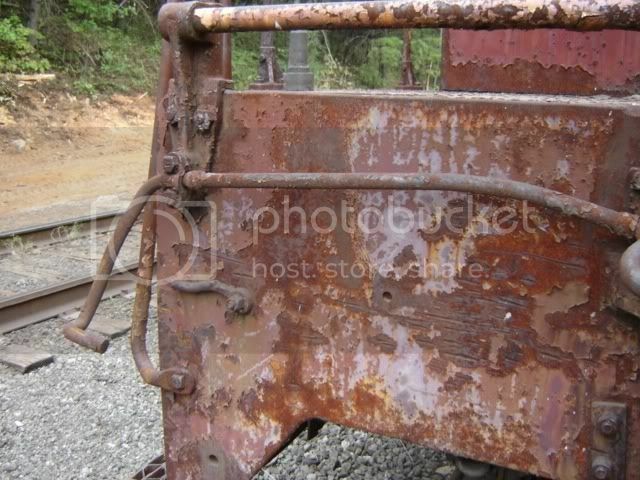 There's no drawing power in a loco that looks like it's ready for the scrapper, is there? This shot shows the hood, with lots of rust, and scaling of paint. 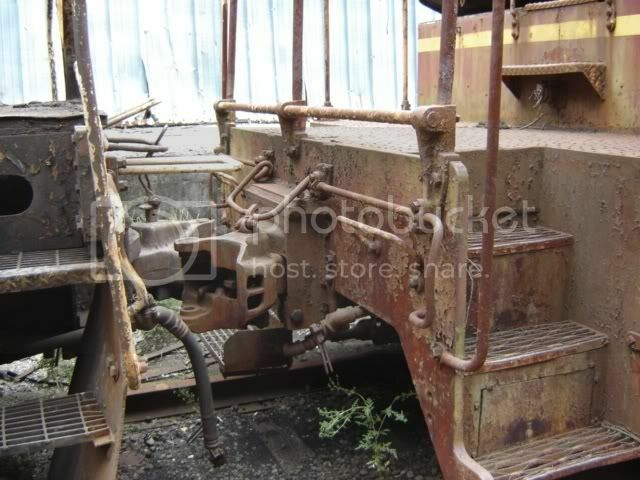 Entire sideframe devoid of paint, carbody rusting through, along catwalk. Note the pre-war paint, already showing through large areas of hood! This view shows the cab, with faded and peeling paint, all paint gone from sideframe and stepwells, rusting of carbody, and cab side walls. 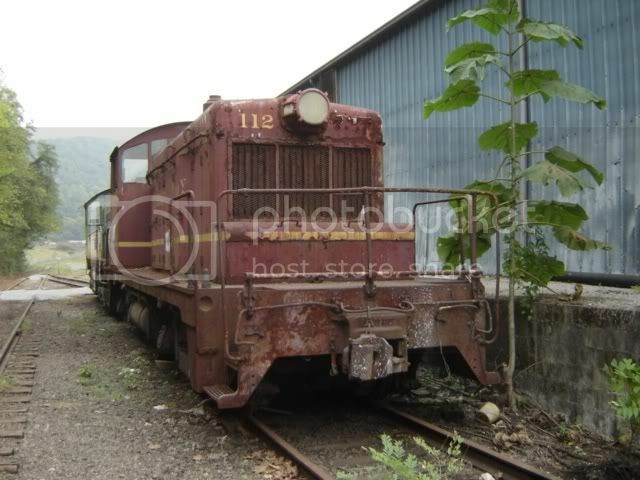 Also note the cab paint has deteriorated, and is missing in large patches. Cancer has taken it's toll, along the carbody where it meets the catwalk. 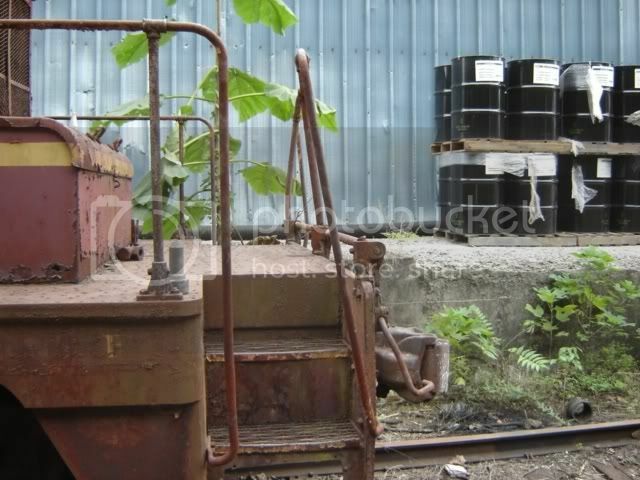 Trucks, tanks and all apparatus under the frame has lost it's paint, and shows remains of all three paint schemes. Front pilot shows collision damage, rusted out sheetmetal, and loss of paint to scaling, and rust. Right front pilot & stepwell area, showing complete loss of paint, damage to grab irons and railings, and damages from being "hostled" by a forklifT. 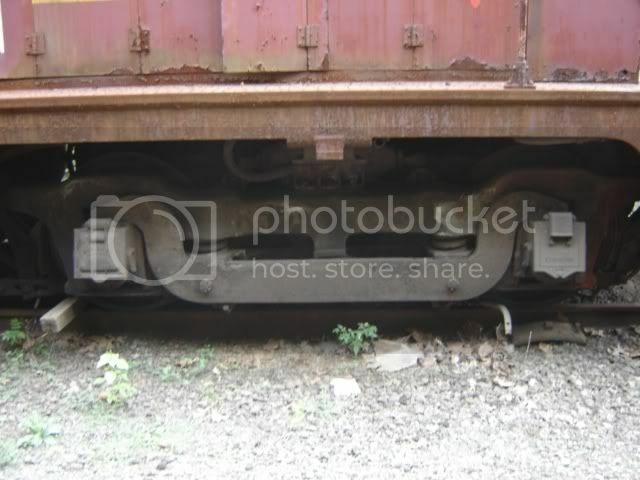 Right rear pilot and stepwell area shows all paint deteriorated, light damage to rails and grabs, and one intact footboard, on the left side!! Rear cab view shows large areas of scaling paint, rusting of lower window edge, on right cab end windows, crease in right outer cab wall and loss of paint under roof overhang with original 1939 paint showing through. My apologies if I offended anyone. Yea, LV 112 does look worn and perhaps certain areas should be touched up, but I am sticking to my opinion for now. thanks GA! this is fabulous news! im a little torn on the paintscheme too..
it would be cool to keep her in that "final" LV scheme.. I have to admit it would be far better to sandblast her down to bare metal and put on all-new paint..and the Pre-war paintscheme would be fantastic! I have an educated guess where 112 is going! but im not sure the owners want that public yet..
im sure it will come out soon enough. Wow, first I get an LV tug boat to ride around on, now a pre-War SW-1 to visit..........2007 was good to me! Someone slap Tery for being obstinate. Happy New Year! LV 112 is on the move! 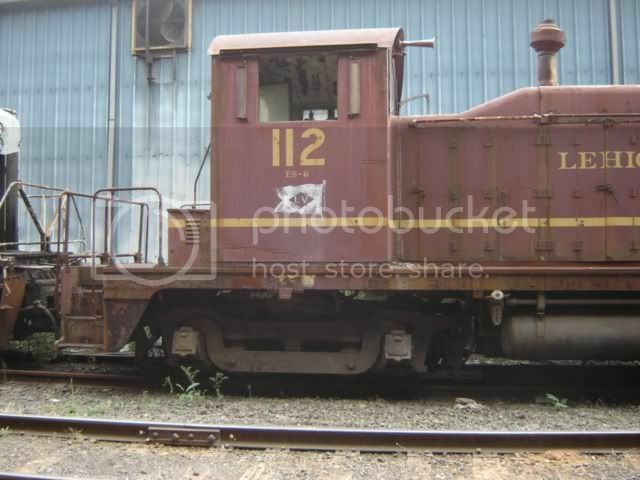 I recieved a video, via email, (thanks "sjksk") of 112 being spotted for NS interchange..
She should be rolling from Tennessee toward NJ any day now!